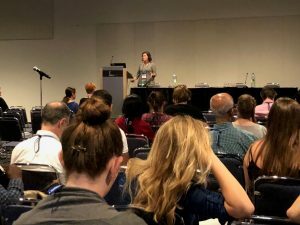 The education concurrent symposium at Plant Biology 2018 attracted a wide array of scientists committed to the importance of educating the public and students about topics in plant biology. Each speaker presented a creative way to generate knowledge and excitement about scientific discovery either to students in the classroom or to the public via various outreach projects. Many of the presentations generated thoughtful questions about how best to adapt the presenters’ ideas to specific situations as the attendees and speakers alike shared their passion for education through lively discussion. 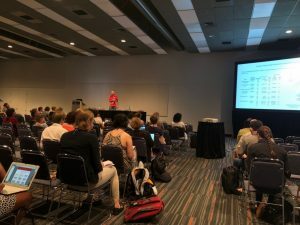 Scott Woody (University of Wisconsin – Madison) presented a set of self-compatible rapid-cycling Brassica rapa fast plants that can easily be used in the laboratory classroom. When taking genetics lab courses, students often explore Mendelian inheritance using fruit flies. Scott Woody (University of Wisconsin – Madison) presented a set of self-compatible rapid-cycling Brassica rapa fast plants (FPsc, https://fpsc.wisc.edu) that can easily be used in the laboratory classroom. One obvious benefit of this collection is the easily scorable set of mutant phenotypes that have been created. Woody described several examples of how these plants could be used to teach core concepts in genetics, including mapping projects that could be completed by undergraduates and even high school students through the use of PCR-based molecular markers. Several inquiry-based activities using these plants were described, and many attendees visited the ASPB education booth to see these plants for themselves and participate in demonstrations of related activities. If you were asked to generate a list of expert geneticists, how much diversity would your list include? Jennifer Robison (Indiana University-Purdue University Indianapolis) sought to expose the students in her undergraduate genetics course to the contributions of scientists from a wide range of backgrounds. When asked to create a list of scientists from memory, the students initially recalled names that were predominately male, and none of the scientists was from an underrepresented group. Students were then randomly assigned to research and write content about a scientist from a group that spanned diverse cultural backgrounds and identities. Following the intervention, Robison again asked students to list as many scientists as they could remember and measured increases in both the number of females and of underrepresented minorities, as well as many more total names than in the initial assessment. This intervention had the added benefit of making students aware of scientist role models who look like themselves. Variations on this activity could be added to virtually any course. Nicholas Ruppel (Randolph-Macon College) described a project to knock out Arabidopsis genes using CRISPR/Cas9 in an undergraduate Genetics course. The goal was to create new alleles of genes like werewolf, too many mouths and glabrous1, which have seedling or juvenile-stage phenotypes that are well-documented in the scientific literature. To fit the experiment into a 13-week semester, students transform adult plants with a pre-made CRISPR plasmid construct in the first class so there is time to score second generation transformants before the semester ends. While first and second generation plants are growing, students do background reading to become familiar with the phenotypes of existing mutants of the genes of interest and use The Arabidopsis Information Resource database (TAIR, https://www.arabidopsis.org) to analyze gene structure. PCR is used to genotype plants. This exercise is a relatively quick way to give students some hands-on experience with applications of CRISPR in plants. Course-based undergraduate research experiences (CUREs) are becoming a popular way to engage students in authentic research experiences within the confines of a traditional laboratory course. Alenka Hlousek-Radojcic (University of Delaware) described several aspects of a CURE based on the biology of Bonsai plants. Students are given time to hone experimental skills like microscopy and the measurement of transpiration rates. They are then guided through the development of an independent question. The module also requires the students to work in teams, which is a critical aspect of scientific inquiry. While at Southern Illinois University-Carbondale, Jessica Lucas was part of an NIH-funded team whose goal is to better prepare underserved community college students for the transition to four-year universities. Focused specifically on students interested in the biomedical sciences, Jessica described an eight-week immersive summer research experience based on analysis of Arabidopsis seed coat mucilage mutants because this specialized extracellular matrix is easy to visualize with ruthenium red. The program emphasized experimental design, quantitative reasoning, utilization of available online resources, scientific communication skills, and collaboration skills. Students reported increased interest in earning advanced degrees in the biological sciences after completion of the program. Anne Sternberger (Ohio University) presented the DNA Detective module, which is targeted to students in grades 6-12. This activity uses the publicly available DNA Subway website (dnasubway.cyverse.org) to analyze one of several “mystery” plant DNA sequences. Once students identified their particular gene, they investigated its known mutant phenotypes and were then presented with a variety of live mutant plants to observe. All students successfully matched their gene name to the corresponding mutant plant, indicating that they understood the connection between genotype and phenotype.